cryptonaut-in-exile: Review of Graham Moore's The Sherlockian | Hardly a rave, but my curiosity remains piqued. 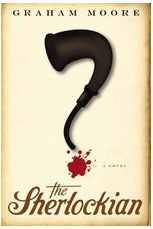 Review of Graham Moore's The Sherlockian | Hardly a rave, but my curiosity remains piqued. Half is historical fiction focused on the buddy-detective duo of Arthur Conan Doyle—who has just killed off Holmes in disgust—and Dracula-creator Bram Stoker. After an attempt on Doyle’s life by an enraged suffragette, the novelists become embroiled in a murder-mystery that would test the abilities of the great deducer himself. The other half of the book is set in the modern day and follows the newest initiate of The Baker Street Irregulars, Harold White, who finds his Watson in a spunky reporter named Sarah. Together, they embark on a red-herring-strewn twin investigation: Who offed the head of The Irregulars, and whatever happened to the long-lost diary that has become the Holy Grail for Doyle-enthusiasts?